Windows 10 is currently the most advanced operating system for Windows-based PC. Lots of users have updated to this version to enjoy its great new features and the new platform look. However, some inevitable problems will also come along. One is the compatibility of the applications with Windows 10. To rip Blu-ray on Windows 10, you got to ensure that you have the right Windows 10 Blu-ray ripper that works well on this operating system. Load Blu-ray discs directly from original source. Load Blu-ray folders and ISO files in just a few clicks through the browser menu directory. Rip Blu-ray to popular video and formats without loss in quality. Watch your favorite titles from your Blu-ray collection on portable devices. aPubsoft Blu-ray Ripper inclusively keep High Definition into video playback streaming for eye catching visuals in crystal-clear defined and bright image display. 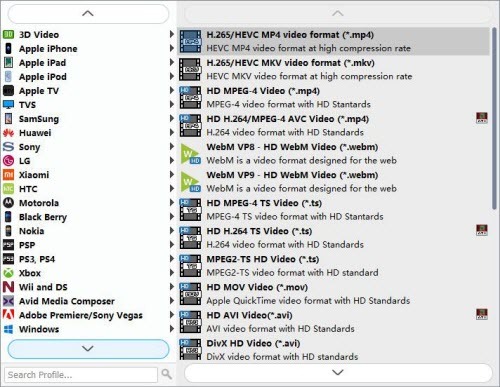 With a simple menu and familiar interface, not too complicated, aPubsoft Windows 10 Blu-ray Ripper can rip the latest Blu-ray movies to video and audio files in most formats, like AVI, MP4, WMV, FLV, MPEG, MOV, MKV, RMVB, FLAC, AAC, AC3, AIFF, AMR, M4A, etc for playing with various popular media players and devicess, like iPhone, iPhone 6/6 Plus, iPod, iPad, iPad Air 2/Air, iPad Mini 3/Mini 2, PSP, PS3/PS4, Apple TV 3, Zune, Xbox 360/720, Blackberry, Android phones, Samsung Galaxy S6/S5, LG G3, Nexus 6, HTC One (M9)/M8, etc. How to Rip Blu-ray Discs on Windows 10? Step 1 Free download aPubsoft Windows 10 Blu-ray Ripper and install it to your PC. Step 2 Insert a Blu-ray disc into the Blu-ray drive, the Blu-ray ripper for Windows 10 will automatically load the disc information. If you want to rip a Blu-ray folder or Blu-ray ISO file, click Browser to choose it from computer hard drive. Step 3 Choose a destination for the ripped files from Target and select a format or device as Profile. The Ripper can automatically decodes Blu-ray protection and choose the most appropriate format for your device. Step 4 Click Start to begin ripping your Blu-ray disc on Windows 10. 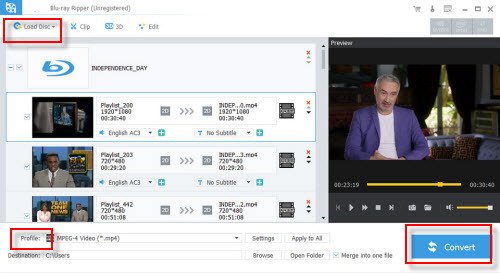 In nearly half of the playback time of the movie, you can enjoy your favorite Blu-ray movie on your computer or devices. Free download its free version and have a try on your new Windows 10 operating system, aPubsoft Blu-ray ripper is compatible with Windows 10 perfectly.